This article was originally published  in The Mark News. I recently joined a group of scientists in announcing a surprising discovery  in Science magazine: There are vast forests in the world's deserts and drylands—about 1.8 million square miles of them (467 million hectares), an area larger than the size of India! Researchers at the UN Food and Agriculture Organization, WRI and several other organizations worked with local experts to examine hundreds of thousands of high-resolution satellite images on Google Earth, painstakingly counting individual trees and shrubs. In the end, we found the equivalent of another Amazon rainforest that we never knew existed. You might be surprised to learn that the world's deserts and drylands are full of trees. Many of us think of these landscapes as an endless expanse of rolling sand dunes or open bushlands. 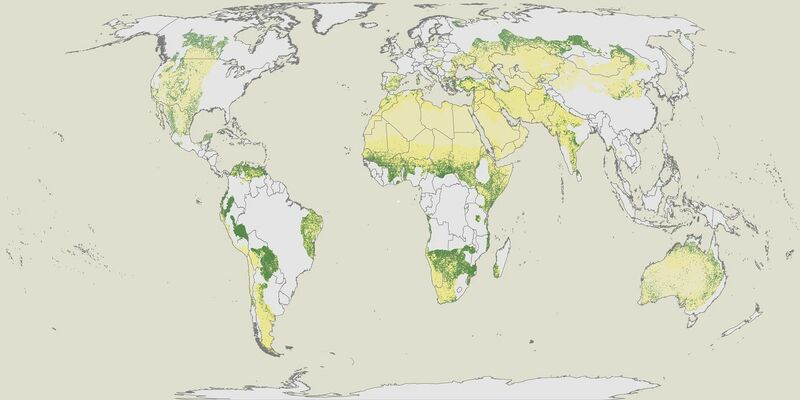 In fact, drylands are a diverse set of landscapes that cover more than 40 percent of the world's surface , from the plains south of the Sahara to the steppes of Central Asia and the savannahs of Latin America. Dryland forests can be sparse and difficult to monitor, which is likely why the trees weren't previously discovered. We simply didn't have the right techniques or adequate satellite power needed to zoom in on small patches of trees. These areas typically don't receive a lot of attention in global discussions about the environment, but the discovery of these new forests could be hugely important for the people who call them home. Around the world, drylands are home to about 2 billion people ; 90 percent of them live in developing countries. These are some of the world's poorest people, many of them small-scale farmers and herders who depend on the natural environment for their food security, livelihoods and sole source of income. For these communities, our “discovery” of these “new” trees using space-age technology just confirms what local people already knew – that trees exist across the drylands and are a vital resource for the people who make their homes there. A single tree in the desert can be a farmer's source of energy, food and respite – shade from the hot desert sun. Unfortunately, much of the world's dryland forests have already been lost to deforestation, overgrazing and desertification likely accelerated by climate change. When these trees are lost, their benefits disappear, too. People can no longer harvest them for firewood, livestock no longer have a shady resting place, and soil loses its vitality and blows away in the wind. As the land degrades, people are forced to move , creating refugees and fueling the already serious global migration crisis. However, there are clear opportunities  to increase the protection and restoration of dryland forests. This can include planting new trees, protecting existing ones under threat, and allowing seeds and root systems to regenerate naturally by guarding them until they're hardy enough to survive the teeth of foraging goats and cattle. There is already evidence of how forest restoration and improved land and water management has improved the livelihoods of communities around the world. In Niger , a farmer-managed natural regeneration  movement—where farmers protected and managed naturally occurring trees and shrubs alongside agriculture—helped increase crop yields, produce food for livestock, improve household energy supply and increase incomes. In the mid-1980s , these farmers collectively restored roughly 5 million hectares—more than 19,000 square miles—of land with more than 200 million new trees. In Northern Ethiopia , now greener than at any point in the last 145 years , local communities organized to control livestock grazing and wood cutting on degraded plateaus and mountain slopes, allowing vegetation to regenerate. The landscape has been completely transformed, helping farmers increase crop production, secure water supplies and build resilience to drought. Similar success stories are emerging all around the world. New initiatives like the African Forest Landscape Restoration Initiative (AFR100)  have started accelerating restoration by sharing best practices and providing access to restoration finance. Now that we know where the trees in the world's deserts and drylands are, we can better monitor and manage them. And by measuring the benefits that trees in drylands generate, we can encourage others to invest more in these overlooked, rural places. Governments should remove barriers to restoration, for example by making sure farmers have clear legal rights  to their land and trees. Businesses can look for opportunities to invest  in restoration projects. And we can all do more to support restoration efforts like the Greenbelt Movement , founded by Nobel Prize Winner Wangari Maathai. These efforts could unlock the ability of local communities in drylands to manage their own restoration, pulling themselves out of poverty and fighting climate change along the way. Let's work together to make the world's deserts and drylands just a little bit greener.